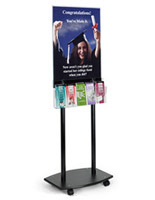 This brochure stand with floor mount is a freestanding display that looks great in a retail space or travel venue. 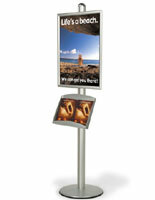 This leaflet holders system has framing for a large image above the flyer holders. 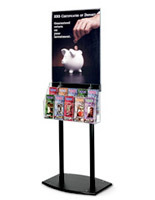 This brochure stand with floor mount catches attention coming and going. 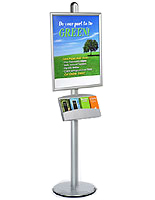 This poster holder is perfect for advertising and directions, with pockets for related pamphlets that can be arranged in different sizes. 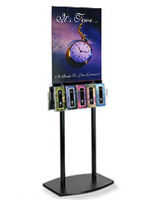 This literature rack is sized 22" x 28" for back-to-back positioning. 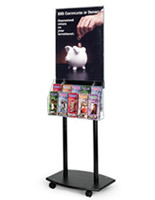 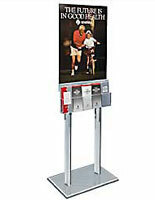 This brochure stand, such as a freestanding display, is shipped with hardware for easy installation.